The Jawbone ERA Bluetooth headset continues the parallel Jawbone traditions of leading noise reduction technology and more and more accessible designs, as with the previous Jawbone ICON (see earlier post). On the technology side, the ERA updates the NoiseAssassin noise reduction and auto-adjusts inbound call volume to your environment. And it boasts clearer, stronger "HD audio" sound with a bigger 10mm wideband speaker (25% larger than previous models). And for ease of use, the ERA has a built-in accelerometer for motion controls -- TapTap to answer calls, or ShakeShake to start pairing mode (a lot easier than some obscure multi-button sequence). The ERA has a clean, compact design, with the trademark Jawbone budge for the voice activity sensor that rests against your cheek, plus a dedicated power switch and standard microUSB port for charging. But the key test is noise reduction, and again the Jawbone excels -- Even standing on Broadway in Times Square the voice quality in both directions was impressive, with little leak from background engines and horns and sirens, and with less distorted voice quality. So this is a top-notch headset, albeit at a step-up price of $129, available in four designs -- Black Diamond, Blue Wave, Grey Hex, and Red Dot. The ERA also supports the Jawbone MyTALK online platform for updating the headset to personalize settings and download new apps, features, and software updates -- including Caller ID by Name. There's also the Jawbone THOUGHTS free iPhone app to organize and share voice messages without typing or calling. Jawbone has moved beyond its home in Bluetooth headsets (see previous post) to introduce the Jawbone Jambox portable wireless speaker. The Jambox boasts oomph in a small package for streaming hi-fi audio, with proprietary acoustic drivers and moving-wall passive bass radiator to pump out 85 decibels of sound -- all in a 6-inch package (6 x 2 1/4 x 1 1/2 inches) that weighs 12 ounces. The Jambox has a subtle design, with wrap-around metal grill and molded rubber top and bottom for secure positioning. The top has low-profile "+" and "-" volume controls, plus a Talk button for start/end call, spoken status, or special features like Voice Dial. The power switch on the side also serves to start Bluetooth pairing, and as a status light. Or you can connect audio sources directly with a 3.5mm stereo audio input. There's also a microUSB port for charging the battery, which is rated to play approximately ten hours. The Jambox also supports the Jawbone MyTALK online for downloading new apps, features, and software updates. So if you have a hankering for better audio when on the go, the Jawbone Jambox provides strong sound in a relatively portable package, and can be yours for $199. MAGIX offers a broad range of multimedia software (photo, graphics, video, and music), especially by pouring impressive technology inexpensive consumer tools. In this tradition, MAGIX Movie Edit Pro 17 packs an impressive punch for a $59 video editing tool, with the Plus version for $99 adding even more sophisticated features including effects masks, MultiCam editing, and Dolby Digital 5.1 mixing -- plus stereo 3D editing with photos and video. This is serious video editing, not an "E-Z" consumer application -- Movie Edit Pro provides deep support for the latest technologies and devices. It supports direct import from portable devices and HD camcorders (including native AVCHD), editing with extensive transitions and effects, and audio dubbing, and then export to portable devices, online, and to DVD and Blu-ray with animated menus. The traditional (albeit somewhat idiosyncratic) video editing interface supports storyboard and timeline editing, including keyframed effects. But the real reward comes from digging deeper in the menus and options to find and explore a plethora of other features, wizards, and ancillary tools, from ad removal and map travel animation to 3D character and scene animation. If you want to explore and grow their movie making skills, Movie Edit Pro should keep you occupied and exploring for quite a while. 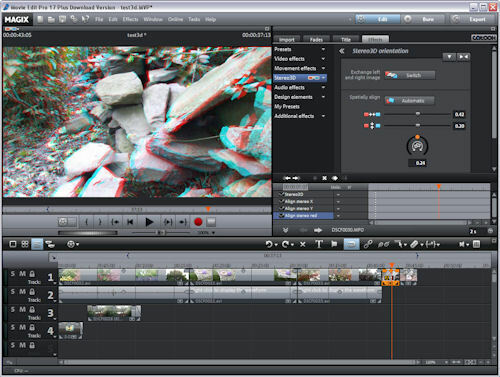 MAGIX offers a trial download of the Plus version so you and see for yourself how it could work for you. See my full review for Videomaker Magazine. See my Video Editing Software Gallery for information and links on video editing tools. Entries posted to Manifest Tech Blog in April 2011, listed from oldest to newest.